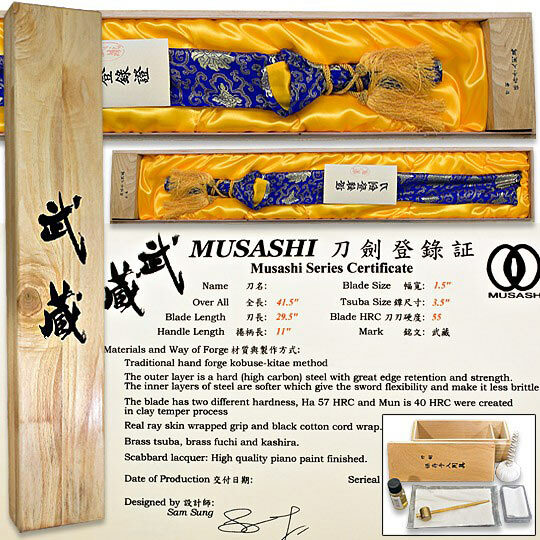 Current stock of this model is with midnight blue color saya instead of black. Forged using kobuse wrapped method with 1060 high carbon steel core and high-manganese carbon steel expertly wrapped around the front and sides. San Mai forged with clay temper to produce Ha 57 HRC (edge hardness), Mun 40 HRC (back and core hardness). Extremely sharp hand honed edge. Although they proved difficult to photograph, there are countless beautiful layers visible along the entire blade in addition to the authentic hamon. Not a cheap screen print or faux style, this is a real folded carbon steel blade. The outer later is a very hard carbon steel chosen for great edge retention and strength. The inner layer is a softer carbon steel and allows for flexibility while keeping the hard blade from being brittle. Both high carbon steels work together and the end result is a sword designed for high performance cutting with fast recovery. 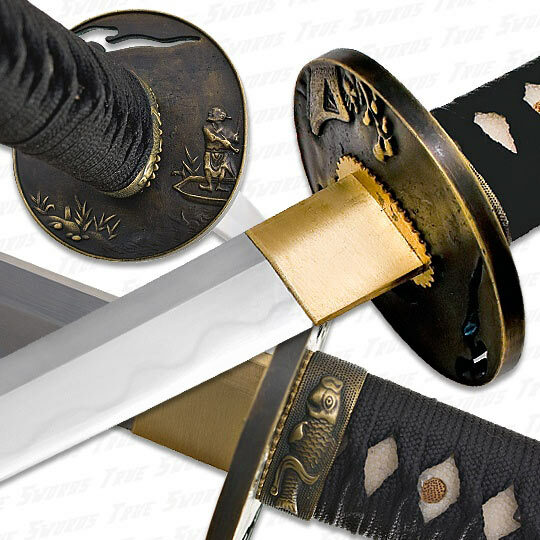 This modern day production uses the same production methods used to forge the renowned Japanese samurai swords of times past. Absolutely stunning workmanship and attention to detail. Traditional hand forge kobuse wrapped method (San Mai). Blade hardness: Ha 57 HRC (edge hardness). Mun 40 HRC (back and core hardness). High-manganese carbon steel wrapped 1060 high carbon steel core. Hamon and hardness created with clay temper process. Thick brass tsuba, fuchi, and kashira. 41.5 in. overall, 29.5 in. blade, 11 in. handle. Serialized with Certificate of Authenticity. Oversized hardwood storage and presentation box with logo. Sword Cleaning & Maintenance Kit. I have not tried cutting anything with the sword yet. It is nicely finished though a little plain . The hada (grain in the blade ) is not visible anywhere on the blade. Mine does not look like the photograph at all, in this regard. I hope mine is a San Mai because you can not tell it by looking ! Do not expect the Damascus look. ok, so i received the sword, which does look and feel excellent, and the box that it came in along with all the supplies were beautiful as well. 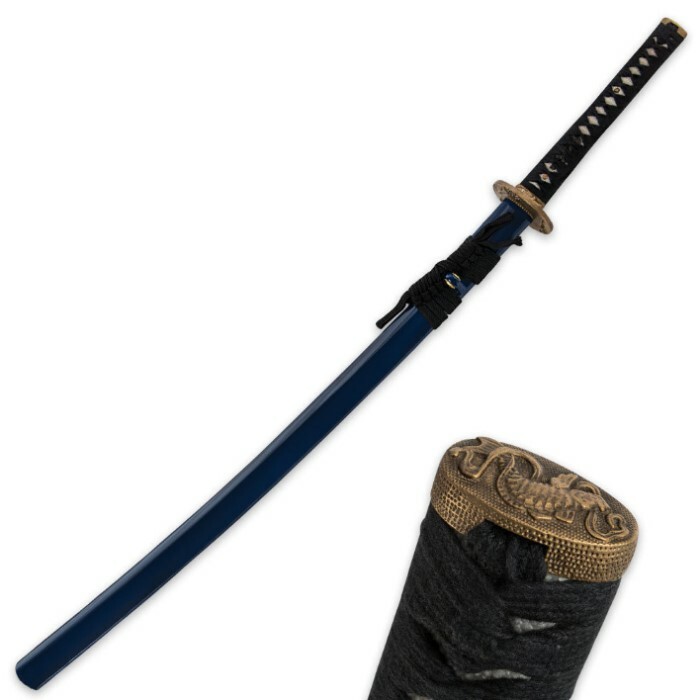 I do have a few concerns though, one in both the picture and the certificate of authenticity it says that the sheath is black, but the one i received is blue, like a navy blue. 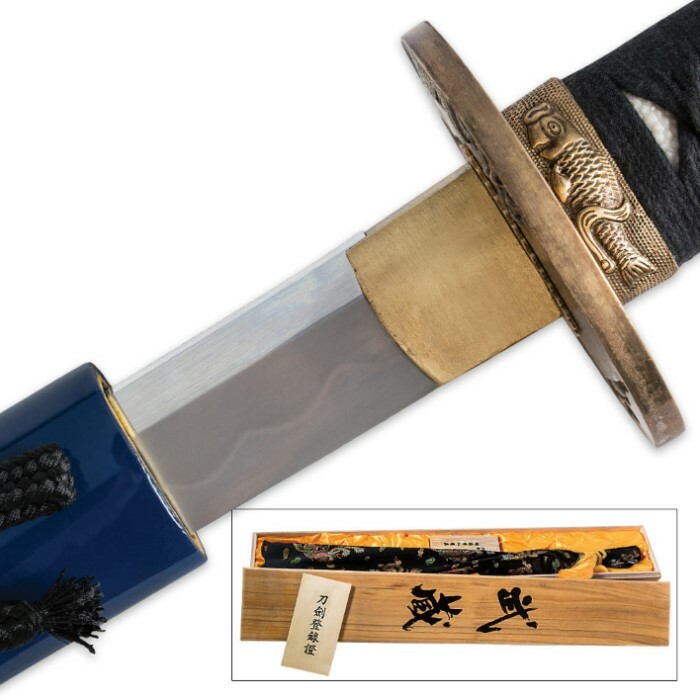 the only other concern i have is that in the picture as well and the description it shows and describes how your able to see the layers from the folded steel and such, and in the picture you can see them quite well, but i literally don't see any folded layering at all on my sword. So i do kinda wonder if maybe the sword itself that i got was wrong, but everything else i got was correct? I know its unlikely, but id kinda still like conformation that i got the correct item, cause its quite expensive and i really do hope i got my sword. Otherwise i'm completely satisfied with my purchase of this amazing sword. 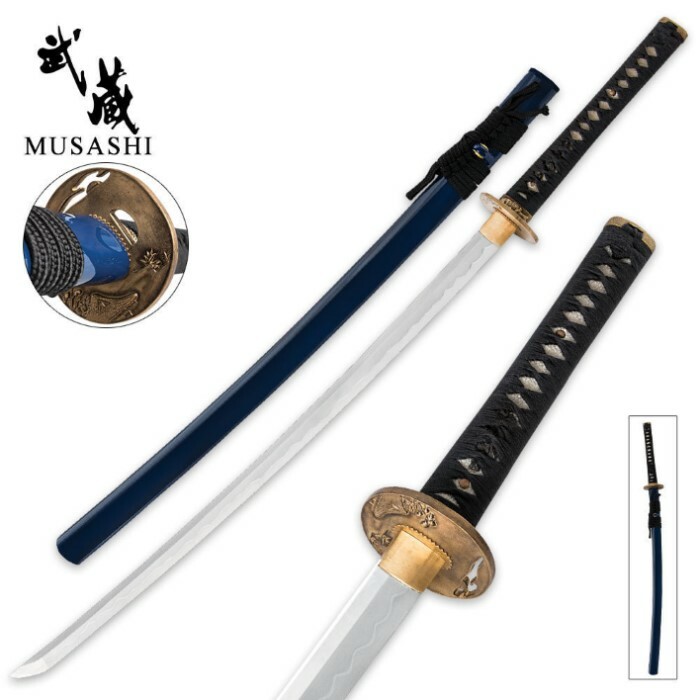 I would like to start off by saying Congrats to all who have purchased this sword. Ten minutes with this blade and i was in love. most embarassing was after those ten minutes i ended up in the hospital getting stitches in my finger from the wound i suffered from just accidently grazing the sword across my finger. EXTREMELY SHARP!! Thank you true swords. Thank you from the bottom of my heart! !